Please call Yellowstone Superintendent Dan Wenk and tell him to reject the 50-year quarantine plan, that our country’s last wild buffalo — our national mammal — deserves to live wild and free, not reduced to meat behind fences or as an exhibit behind bars. CALL NOW! Yellowstone Superintendent Dan Wenk at (307) 344-2002. Zoo proponents argue that these institutions are working to “restore” bison populations, yet their form of “restoration” puts more buffalo behind bars and fences, to be placed on exhibit in zoos for the entertainment of zoo visitors. The latest damaging insult to buffalo who originated as wildlife in Yellowstone comes from an unlikely place: the Ft. Peck tribal government. On Friday news came that Ft. Peck — home to Assiniboine and Sioux plains buffalo people — doomed eight of their quarantined Yellowstone buffalo to New York City’s Bronx Zoo. Quarantine is a bad enough life, being a tool of domestication, and has been used — and could be used again for the next fifty years if Yellowstone has their way — by state, federal, and tribal governments to manipulate and control members of the world’s last wild and most important buffalo, the Yellowstone herds. In 2005 and 2006, state and federal governments initiated a Quarantine Feasibility Study which was strongly opposed by wild bison advocates. During the study, hundreds of wild buffalo calves and their families were rounded up in traps and tested for brucellosis, a cattle disease that wild buffalo have never transmitted to livestock, and one they have built resistance to, that, outside of politics, poses no threat to them, nor to livestock. All of the buffalo, except for hundreds of the calves, where shipped to slaughter. The calves, now unnecessarily orphaned, were trucked to a state-federal quarantine facility where they grew up without elders in a life of domestication, tested and tormented by scientists, fed hay, ear-tagged, and forced to live in small pastures surrounded by double-electric fence. Through the years of testing and manipulation, many of these buffalo were slaughtered and others died due to human handling. Those who survived the ordeal would never be wild again, but would be doomed to a life of domestication, severed from their wild communities and relationship with the land. Now, we learn, they will suffer being placed confined and exhibited in the Bronx, New York. The Quarantine Feasibility Study — strongly opposed by BFC — was completely unnecessary manipulation of wild buffalo that turned out to be an immense failure. And it certainly was never intended to doom buffalo to life in a zoo. The lofty promise of the Quarantine Feasibility Study, to “restore wild buffalo” on public and tribal lands, was never realized. The buffalo or the offspring of the buffalo who emerged from quarantine ended up as either the private property of billionaire Ted Turner, serving his commercial ranching interests, or as ranched buffalo in tribal herds, living the rest of their lives behind fences. Tribes at both Ft. Peck and Ft. Belknap received quarantined buffalo that Turner didn’t keep for himself. At Ft. Peck, numerous buffalo died from a fire because they could not escape their enclosure, and nearly half of Ft. Belknap’s herd died from dehydration when a pump broke and they couldn’t get past the fences to find water. Proponents of quarantine wrongly suggest that this is the only way that bison will be restored to public and tribal lands. Every winter and spring, the wild, migratory buffalo of Yellowstone tell us otherwise: every step they take is an act of restoration. 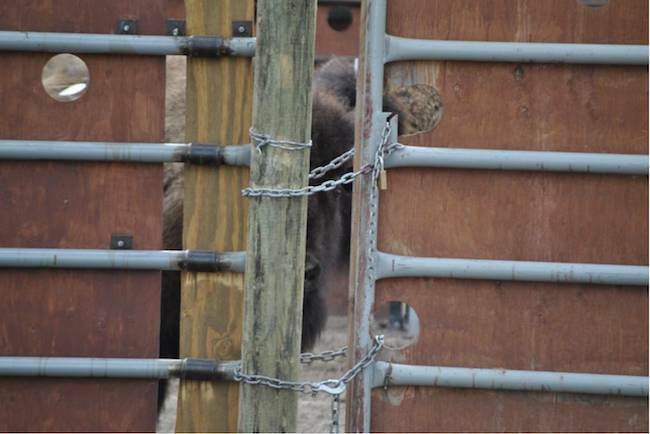 Zoo proponents argue that these institutions are working to “restore” bison populations, yet their form of “restoration” puts more buffalo behind bars and fences, to be placed on exhibit in zoos for the entertainment of zoo visitors. Zoos are the end of the line for any wildlife. The Yellowstone herds — our country’s last continuously wild populations — face death, domestication, or life in prison. These tools of the dominant culture are the so-called choices the government offers, and it is our responsibility as advocates of the wild to reject them. Wild is the only way. Our charge is not to try to improve upon these oppressive systems, but to dismantle them altogether. Yellowstone National Park has still not issued their decision on a proposed 50-year quarantine plan, a dangerous scheme that wild bison advocates vehemently oppose. Even so, entrapped at their capture facility since late-February of 2016, “just in case” they approve this nefarious plan, stand forty-nine young buffalo. Seven months ago, they were captured from the wilds of Yellowstone while migrating through the Gardiner Basin. Every one of their family members who were captured with them — mothers, aunts, brothers, sisters, grandmothers, cousins all — were shipped to slaughter. Some of these young buffalo who were “set aside” to be held for quarantine purposes have been slaughtered themselves. The fate of the remaining buffalo is unknown, but their current choices are death or domestication, and now, potentially life behind bars at a zoo. The public comment period for this quarantine plan ended many months ago, but Yellowstone still needs to hear from you.